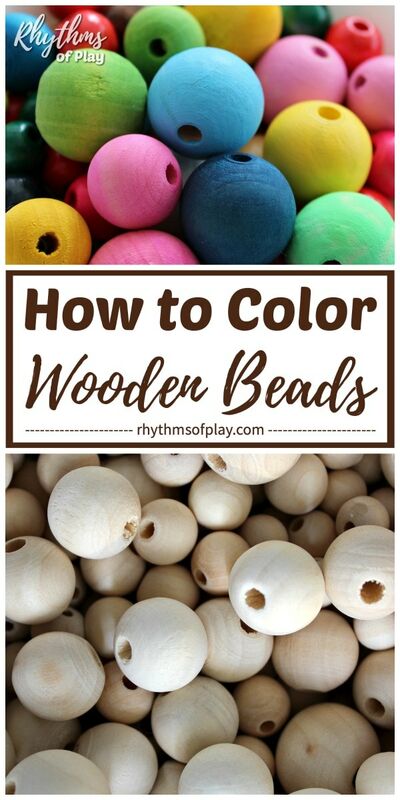 How to Color Wooden Beads: 3 Easy Methods! 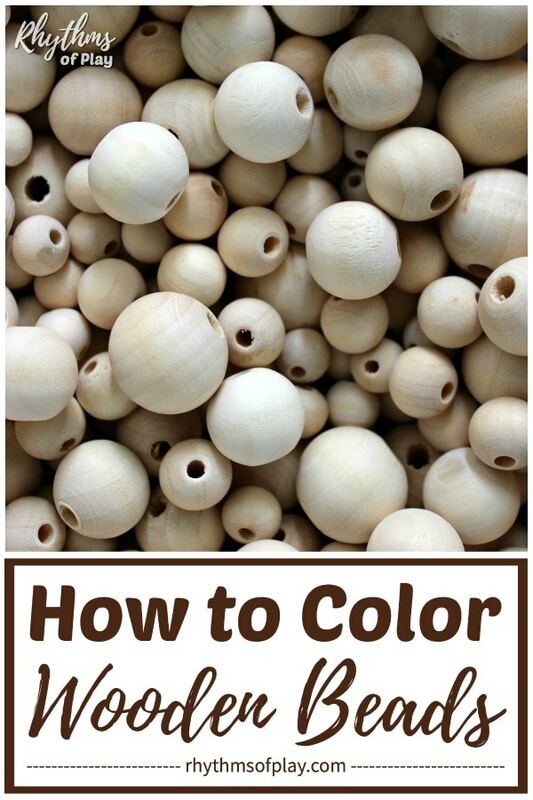 Learn how to color wooden beads for crafts and jewelry making projects. Below we have provided step by step directions for 3 methods to color or dye wooden beads. 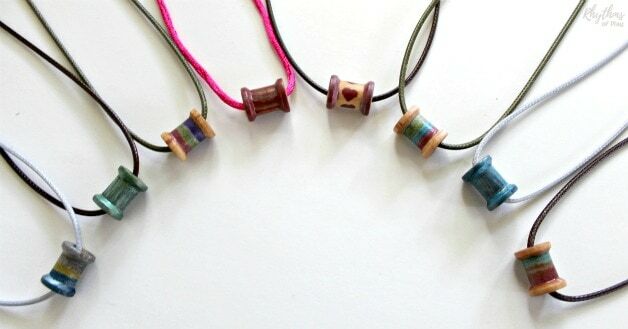 Use colored wooden beads to make jewelry, crafts, and DIY projects. 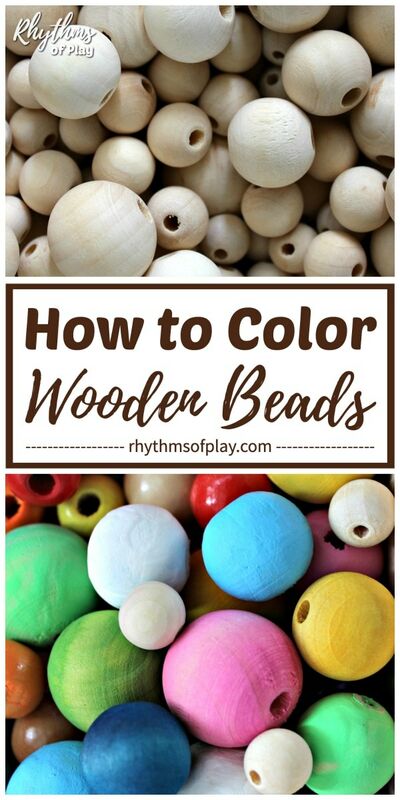 We have come up with several different ways you can use to color wooden beads. The technique that you choose to color wooden beads will depend on the supplies you have available, the type of project that you are doing, or the effect that you are trying to create. This collection of colored wooden bead craft supplies contains several different types of art supplies that you can use to color wooden beads; liquid watercolor paint, food coloring, acrylic paint, tempera paint, and extra fine tip paint pens and/or brush tip paint pens! There are even more supplies you can use than those listed below! The type of supplies you need will depend on how you would like your colored wooden beads to look once they are finished, or, you can use the supplies that you already have to make it easy–up to you! 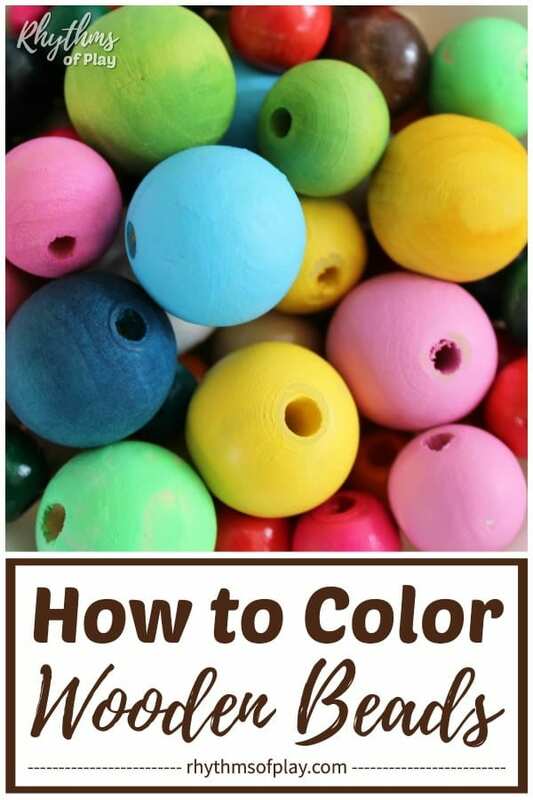 First, choose the method that you would like to use to color, dye, or paint wooden beads from the techniques described in detail below. We have also included video tutorials to make it easy! Next, gather the supplies that you need for that colored bead method. Directions for each way to color wooden beads are written below. There is more than one way to dye, paint and color wooden beads so we have provided 3 main tutorials with a couple of variations for each wood bead coloring technique. If you would like to see how liquid watercolors look on wood, hop over to have a look at rainbow-colored wooden blocks to see all the colors! We even have a color comparison guide that you can use to see how each one will look! Place a few drops of liquid watercolor paint or food coloring in a canning jar or bottle with a lid from the recycle bin. Add more than one color to create new colors! (Note: You will need more than a few drops of liquid watercolors and a wide mouth 16oz canning jar , or larger, if you plan on coloring a lot of wooden beads at a time. Add a few drops of water to dilute the color. Skip this step if you want the deepest or most vibrant color possible. Place a wooden bead or wooden beads into the canning jar or recycled bottle. Put the lid on the canning jar or recycled bottle and give it a gentle shake and a spin to dye the wooden bead or beads. Pour them into a small bowl or tip the canning jar onto its side. Next, slide a toothpick into the wooden bead hole to pick each bead up. Place the dyed wooden bead or beads on a piece of waxed or parchment paper to dry. Alternatively, you can dump them in a strainer over the sink and then place them on an old towel or paper towel to dry. Repeat as needed with more beads and/or using more colors and color combinations. Don’t forget to wash your canning jar in between each color–unless you plan to mix them of course! Please note: Dyed wooden beads will bleed color out if they get wet unless they are sealed and protected. Watch the video tutorial below to learn how to dye wooden beads using this easy coloring process! There are a few different ways you can paint wooden bead with acrylic paints or tempera paints . One method that can be used to paint a wooden bead requires a toothpick and/or a paintbrush . Another painted wooden bead technique requires a small bowl and a toothpick, or, a paintbrush. You can even do a crazy variation of both… My daughter sure did! You can see her painting a wooden bead in the colored wooden bead video tutorial below the written instructions. Thread wooden bead or beads onto a toothpick . Use a paintbrush to paint the wooden bead the color or colors of your choice from the top of the wooden bead down. Flip the toothpick or wooden dowl over to paint the other side of the wooden bead using the same technique. Slide the wooden bead off wooden dowel or toothpick onto a piece of scrap paper and allow the colored wooden bead to dry. Roll it around with a toothpick a few times before it dries so that it does not stick to the scrap paper. Place wooden beads or beads in a small bowl. Roll the wooden beads around with a paintbrush and/or a toothpick to cover the entire bead with color. Poke a toothpick into the bead hole to pick it up and place it on scrap paper to dry. Roll the colored wooden bead around a few times before it dries so that it does not stick to the scrap paper. The painted wooden bead video shows the colored wooden bead methods listed above in action! Another fun and easy way to color wooden beads are with paint pens. Extra fine tip and brush tip paint pens make it easy to apply color to beads in a gazillion different ways, the only limits are the limits of your imagination. You can choose to color an entire bead one color with a paint pen or choose a few colors. You can even create intricate designs and patterns with paint pens on wooden beads! …and extra fine point paint pens to paint the wooden spool beads in the photograph below. We are working on some more cool videos and photos of examples of colored wooden beads painted with paint pens to share with you very soon! … Stay tuned, and bookmark this page so you can come back to see what we have added! Coloring wooden beads to use for crafts, jewelry making, and DIY projects is fun and easy. You can also purchase colored wooden beads. However, if you need to match a certain color dying wooden beads yourself is the way to go! 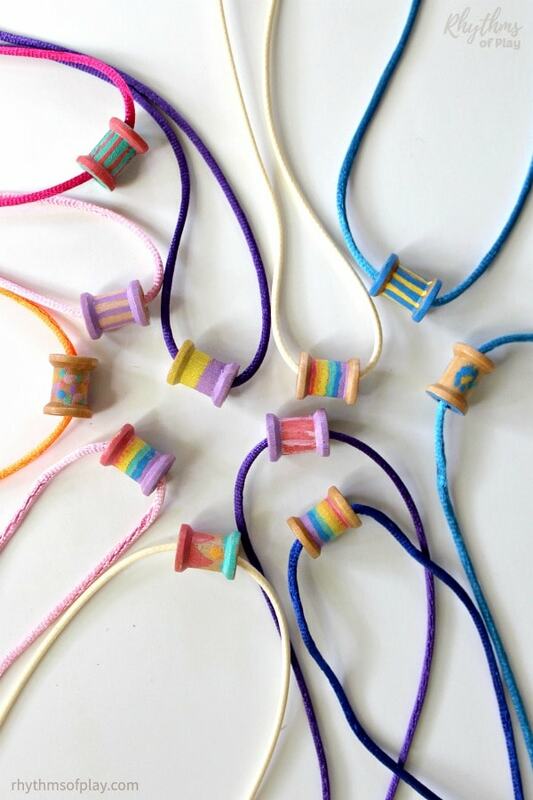 Use colored wooden beads to make wooden bead bracelets, beaded necklaces, bead bunnies, and other fun crafts and DIY projects!